Familiarize yourself with the 3D design software program, 123D Design. 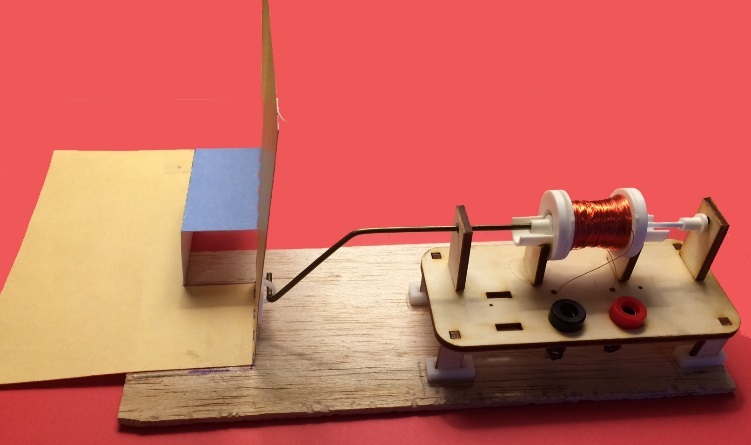 Connect the linear motor to a pop-up card or animated figure. Sending an .stl file to a 3D printer is analogous to sending a PDF file that someone else has created to a laser printer. Creating an original design using 3D design software is analogous to writing your own document. The previous lab provided an introduction to 3D printing through printing and assembling the parts for a linear motor. 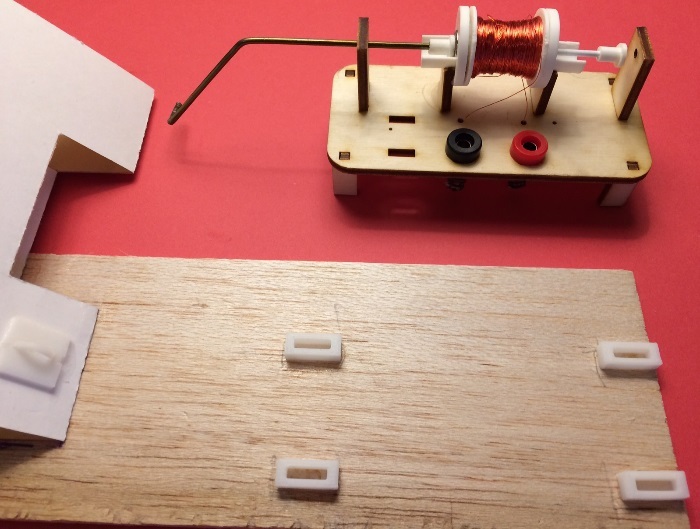 In this lab, you will design your own 3D printed components and use them to connect the linear motor to the pop-up card or animated figure that you developed in Lab 1. Professional engineers use programs such as Solidworks and Autodesk Inventor to design 3D printed objects. Artists and graphic designers use programs such as Adobe Illustrator to design 3D printed objects. One advantage of Adobe Illustrator is that it can be used to design objects for both the Silhouette digital die cutter and 3D printers. However, these are professional programs that have extensive feature sets and a commensurately steep learning curve. This is a good investment for those who plan to use these computer assisted design (CAD) programs professionally, but are less suited to the casual user. In addition to programs such as Autodesk Inventor, Autodesk also offers 3D design programs for the casual user. 123D Design is one of these programs. In contrast to its full-featured counterparts, 123D Design is relatively easy to master and yet is relatively full-featured. 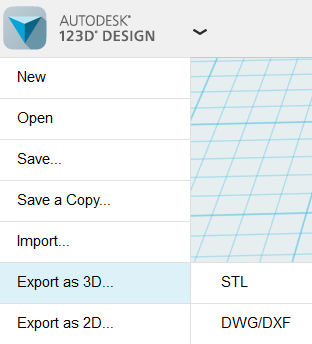 Autodesk makes 123D Design available at no cost to its users, an additional benefit. There are a number of tutorials that provide an introduction to 123D Design, including the video tutorial listed under the Resources section above. Begin by completing the tutorial to familiarize yourself with the basic features of the design program. Once you have a sense of the basic capabilities of the program, you can begin to consider ways in which you might connect the linear motor to the pop-up card or animated figure that you developed. The process of developing a linkage to connect a power source to a mechanism is an important aspect of mechanical engineering. 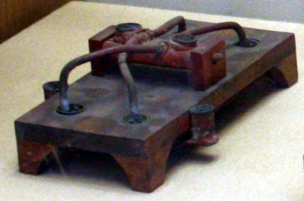 James Watt said that his favorite invention was the mechanical linkage that he developed to connect his steam engine to a pump. Prior to this invention, the piston was attached with a chain. The linkage that Watt invented allowed the piston to exert force on the upward stroke as well as the downward movement, thereby doubling the power of the steam engine. 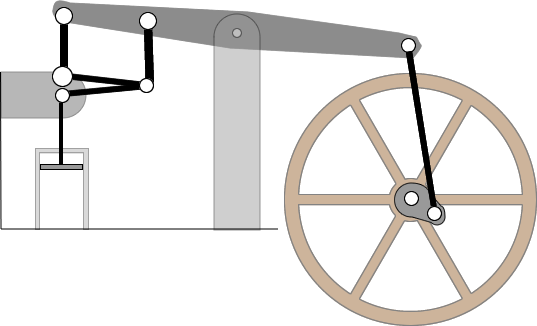 Figure 3.1 The mechanical linkage developed by James Watt was his favorite invention. The objective of this lab is to connect a mechanism to a power source. 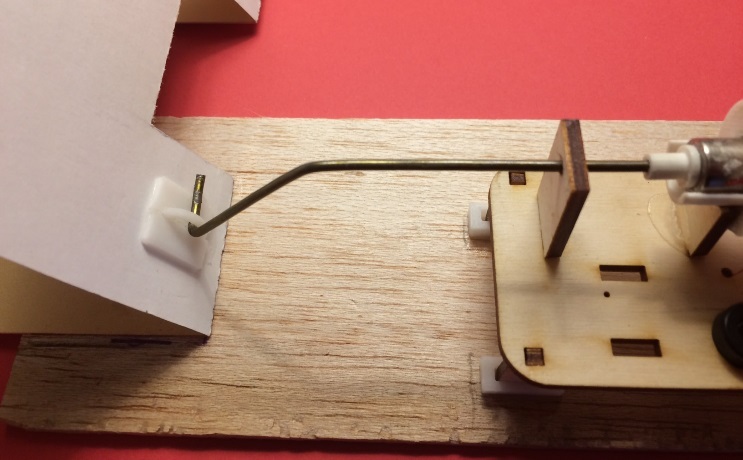 This specifically involves connection of the linear motor that you fabricated in Lab 2 with the pop-up card that you created in Lab 1. The maximum range of excursion that is practical for the armature of this version of the linear motor is about three-quarters of an inch. This imposes a constraint that must be considered in the design process. Figure 3.2 Pop-up card connected to linear motor. One approach to connecting the linear motor to a pop-up card is shown in Figure 3.2. The armature of the motor has been extended and angled downward. A 3D-printed part shown in Figure 3.3 is used to connect the armature to the pop-up card. This design is the simplest strategy that might be adopted. When the motor moves to the right, the armature extends and opens the card. When the motor moves to the left, the armature retracts and closes the card. A more sophisticated linkage might amplify the range of motion. In fact, a subsequent lab will even convert linear motion to rotary motion, expanding the range of mechanisms that can be driven by the linear motor. Since this lab also serves as an introduction to three-dimensional design, the components selected are relatively straightforward. Figure 3.3 3D-printed component and connecting linkage. A 3D-printed loop attached to the card provides a point of attachment for the armature extension. The process required to create the design is outlined in the next section. Manipulating solid figures is similar to two-dimensional drawing, with additional features that allow a third dimension to be edited. The Autocad program 123D Design supports two-dimensional drawing with “sketches.” The two-dimensional sketches can then be extruded to create a third dimension. To create a loop similar to that shown in Figure 3.3, begin by using the Sketch tool to create a circle. This is the tool on the menu bar that resembles a pencil. (Figure 3.4). Figure 3.4 Use the Sketch tool to create two-dimensional drawings. 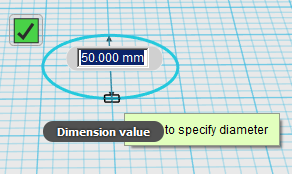 A circle with a specified origin and diameter can be created with this tool. Do not click the green check box or press the escape key to exit this mode once the first circle has been created. Instead, remain in the sketch mode and create a second smaller circle within the first. 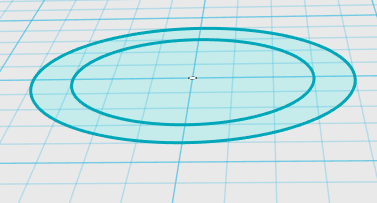 Figure 3.4 A circle with a specified diameter can be created with the Sketch tool. After the two concentric circles have been created, click the green checkbox or press the escape key to exit the Sketch mode. Figure 3.5 Two concentric circles will be used to construct a loop. The icon beside the Sketch tool is the Construct icon. Select the Extrude option within the Construct tool submenu. Figure 3.6 The Extrude option is used to extend a two-dimensional sketch. Use the Extrude tool to extend the outer ring formed by the two concentric circles. This will result in a shape like the one shown in Figure 3.6. Figure 3.6 The extruded outer ring should look like this. Use the Polyline option on the Sketch tool menu to draw a line. Then place the line across the center of the extruded ring. The Modify tool is adjacent to the Construct tool. 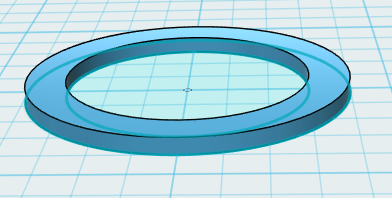 Use the Split Solid option on the Modify submenu to divide the extruded circle in half. Once the circle is idivided into two halves, delete one half of the circle. This will leave the remainng half-circle, as shown in Figure 3.8. The extruded half-circle constructed in this way will be attached to the back of the pop-up card. This will provide a point of connection that can be used to attach the armature extension. Figure 3.8 The “Split Solid” tool can divide the extruded circle into two halves. The Primitives tool allows insertion of three-dimensional objects such as boxes, spheres, cylinders, and cones. The Primitives tool can be used to construct a box that will be used as a base for the connecting loop, as shown in Figure 3.9. Figure 3.9 The Primitives tool can be used to insert a box. Once the two objects are aligned so that they overlap, the Combine tool can be used to form a single object through use of the Merge option, as shown in Figure 3.10. Figure 3.10 Two objects can be merged to form a single combined object. Once a connecting loop for attachment of the armature extension has been formed in this manner, a base for the connecting loop can be created. The base for the connecting loop can be formed in several different ways. One method involves use of the Box tool to form a thin rectangular box that is merged with the connecting loop. Printing the combined object formed in this manner will require use of support materials to support the arch of the connecting loop when the object is printed. The support material must then be pried loose after the object is printed. Another approach is to print the base and the connecting loop separately. If the arch of the connecting loop lies flat on the build platform when the object is printed, support material is not required. However, the additional of gluing the connecting loop to the base is then required after the object is printed. If this method is selected, a slot can be created in the base before the object is printed, so that the connecting loop can fitted to the base more securely. It is up to the designer to determine which of the methods described may be more suitable for a given application. The results of these different methods of printing are shown in Figure 3.12. The object on the left was printed as two separate pieces and then glued together after the parts were printed separately. The object in the center was printed as a single merged object that was placed in the upright position. The object on the right was printed as a single merged object that was placed on its side. The object on the left did not require removal of any support material. The object on the right was printed with support material under the arch to keep the arch from collapsing as it was printed. The object on the right was printed with support material on the backside of the arch, also to keep the arch from collapsing as it was printed. Figure 3.12 Results of different methods of printing. The connecting loop is only about 2 millimeters thick. When objects are printed at this scale, the object can be damaged when the support material is removed unless great care is taken. Therefore, in this instance, it was faster and easier to print the two parts separate in a placement that did not require support material, and then glue them together after printing. Once the connecting loop has been fabricated and attached to the pop-up card, a secure method of attaching the card and the motor to a common base is needed. The motor could be glued to a base, but that would preclude using it in other applications at a later date. Construction of hollow footings glued to base offer a method of securing the motor to the base. Figure 3.12 Hollow footings (foreground) provide a means of attaching the motor to a base. The advantage of this method is that it can hold the motor securely when it is being used with the pop-up card, but allows the motor to be removed for other applications at a later date. The footing should be slightly larger than the feet of the motor. The Subtract option, found on the submenu of the Combine tool, can be used to subtract a space from the footing. If the Scale tool is used to increase the size of the motor foot used for this purpose before the foot is subtracted, the hollow space in the footing created in this manner will allow the feet of the motor to fit snugly into the footings. Figure 3.13 Each completed object can be exported as an “.stl” file. The completed object should be saved in the native 123D Design format once the design is completed. That will make it possible to edit the object later if necessary. Each completed object should then be exported as an “.stl” file. (As noted in Lab 2, “.stl” stands for “stereolithic object.”). This is the native 3D format that will be used by the 3D printer. Once the completed design has been exported as an “.stl” file, this file can be transmitted to the 3D printer. This process is the same as printing method used in Lab 2. (3) the connecting components designed and printed in this lab. A three-phase approach to assembly and testing is recommended: (1) trial assembly of mechanical components with manual operation, (2) pilot testing of electrical components, and (3) operation with switching mechanisms. Before the components are permanently glued into place, a trial assembly is recommended. This can be accomplished with use of a large paperclip or binder clip to clamp the base of the connecting loop to the pop-up card. The armature extension can then be connected to the pop-up card. Once this is done, the armature can be moved manually to see if the armature and pop-up card move smoothly. If the mechanism binds, there are two adjustments that can be made: (1) the positioning of the connecting loop on the card can be adjusted and (2) the distance between the card and the motor can be adjusted. Once card opens and closes smoothly, then connecting loop can be permanently glued to the card. There are several adhesives that would be appropriate for this. Gorilla-brand Super Glue works well in this application. It is available in craft stores and can also be obtained through Amazon. The pop-up card and the four footings should then be glued to a permanent base. A piece of balsa wood or a piece of thick cardstock can be used for this purpose. Permanently fixing the card and footings to a common base will ensure that the card and motor maintain the same relationship to one another. After this step is completed, the feet of motor can be placed in the motor footings and the armature extension can be attached to the connecting loop. A nine volt battery will be used for pilot testing of the electrical components. Operation of the motor was tested in Lab 2. This step will verify that the motor is still working. Connect the two leads of the solenoid to the terminals of the battery. The armature of the motor should move, opening or closing the card, depending on the polarity of the terminals. If the motor does not work, there are several trouble-shooting steps that can be taken. The position of the magnet can be adjusted so that it is halfway in the solenoid tube. The battery can be checked to see if it still has a charge. The connections to the solenoid can be checked with to determine whether there is still a secure connection. Once the motor is verified to operate properly, more advanced methods for operating the mechanism can be explored. Manually reversing the polarity of the battery in the circuit using alligator clips attached to the battery is a slow process. It is useful for verifying that the battery is operating properly, but for long-term operation, a switching mechanism is needed. The type of switching mechanism required will reverse the polarity of the circuit. Joseph Henry, a nineteenth century American scientist who later served as the first secretary of the Smithsonian, developed such as switching mechanism, shown in Figure 3.14. Figure 3.14 Polarity-reversing switch developed by Joseph Henry. The design that Joseph Henry developed is still used in modern pole reversing switches. These switches can be purchased commercially for use in operation of the pop-up card mechanism. Alternatively, the design that Joseph Henry developed can be used as a model for design of your own pole reversing switch. Another method of achieving the same goal is to fabricate a mechanism that will rotate a battery around a spindle. In the design show in Figure 3.15, each half-turn of the battery reverses the polarity of the circuit. Figure 3.15 Each half-turn of the battery reverses the polarity of the circuit. 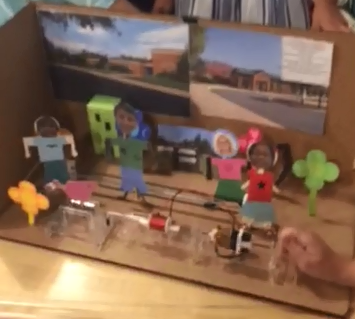 Fifth-grade students at Hollymead elementary used this type of switch to operate an animated diorama, depicted in Figure 3.16, that they developed for a story-telling activity. Figure 3.16 Each half-turn of the battery reverses the polarity of the circuit. The waveform generator introduced in Lab 2 provides another means of producing an alternating current that can be used to open and close the pop-up card. The alternating current shown in Figure 3.17 is a simple sine wave, but more complex waveforms can also be developed to perform specific actions in operation of a mechanism. A waveform generator provides a convenient way of controlling the frequency and amplitude of an action for an extended period of time. Figure 3.17 A waveform generator can produce an alternating current. In a future lab, a method for controlling the pop-up card mechanism with a computer script will be introduced. This type of tangible computing used to control a physical mechanism offers a useful way to introduce computer science concepts.